Free treats, posh treats, iconic treats: Find your doughy-good must-have. Cake, chocolate, sprinkles, powdered, or all of the above? Friday, June 5 is National Donut Day. Many dough devotees love nothing better than to pit two big-time donut dealers against each other, in their minds, while chewing on this hot topic: Which shop makes the tastiest powdered, the crumbliest cake, or the sweetest sprinkled. 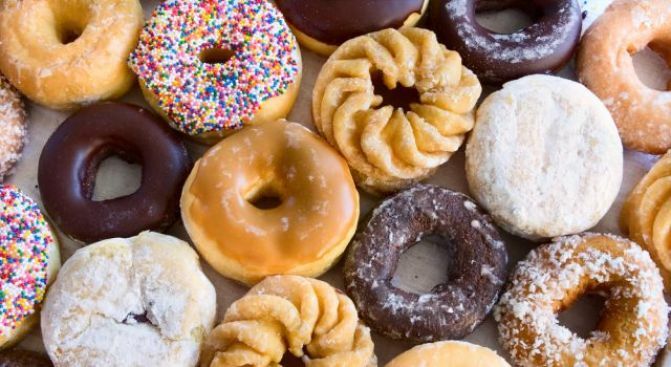 It's a lively, long-running, and not-too-serious battle, but what donut fans need to ponder, as we head into National Donut Day, is this: Should we all go with the treat's casual-quick spelling -- "donut" -- or do we need to throw in a few more letters, and a posher appearance, with "doughnut"? We don't want to step into that particular frosting-covered fracas, for there are more important matters at hand. National Donut/Doughnut Day is nigh and the deals, and delights, shall be plentiful on Friday, June 5. Dunkin' Donuts, the Massachusetts-based icon which only recently set up shop in Southern California, honors the springtime's sweetest day with a sweet deal: Buy the drink of your choice at any Dunkin' Donuts and get whatever donut you like. Keywords: "While supplies last." Surely you can do Dunkin' in the wee smalls of the morning? Set your alarm on June 5. It is, after all, National Donut Day, and you don't want to sleep through the excitement. Regrets may ensue. Krispy Kreme is going a similarly sweet route, but two differences to note: A beverage purchase is not required and the day is called National Doughnut Day, in the Krispy Kreme world. Donut, doughnut... We love the variety but nail-bite over making a social faux pas. And local swank-tavern chain Plan Check Kitchen + Bar is offering its fancy donuts for just two bucks from June 5th through 7th, and, my, they're something: The Space Age Donut, which is available at the Plan Check located on Fairfax Avenue, includes "astronaut" Neapolitan ice cream, marshmallow fluff, and pistachio ice cream. The Plan Check on Sawtelle has a Root Beer Donut, which includes a cookie straw, for its two-buck, all-weekend-long special. Cookie. Straw. Root. Beer. Donut. Suddenly the ol' doughnut/donut contretemps doesn't seem quite so heated, when we can all agree that the National Donut/Doughnut Day deals are good and the donut/doughnut choices are dough-tacular. Which, of course, ranks slightly higher on the spectacular scale than merely spectacular things.